As I’ve mentioned previously I was introduced to the idea of fasting from the podcasts I was listening to. So in May 2017 I decided to seriously consider adding extended fasting into my routine. My average fasting blood glucose had improved significantly from 220 – 260 mg/dL in 2016 to 150 – 170 mg/dL in the beginning of May. But I really wanted this number to be below 100. At 150 mg/dL I was still causing damage to my body. Therefore I really wanted to pursue fasting as a remedy to my high blood glucose, and maybe as a way to speed up my weight loss. 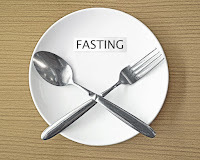 One of my main sources of information about fasting was the “Fasting Talk” podcast which featured Megan Ramos and Dr. Jason Fung of the Intensive Dietary Management (IDM) program based in Toronto, Canada. IDM had a long distance program in which they would act as nutritional consultants for customers. I decided to sign up and just in time for an introduction web seminar on May 19. In the meantime, Brenda Zorn had announced the May 2017 Zornfast on the ketogenic forums. While this was starting the day before my IDM introduction seminar, I decided to join in anyway. I fasted for 90 hours (almost 4 days). During those 4 days I had nothing but water, coffee, and salt. Some people use bone broth during a fast, I opted not to because I found that having something seemed to stimulate my appetite. I did have some issues adapting to fasting. This first extended fast was probably the most challenging fast I’ve had. Megan Ramos talks about fasting being like a muscle. The more you exercise your “fasting” muscle the stronger it gets, and the easier it gets. As your body becomes accustomed to fasting, it becomes easy and natural. However, this was my first real extended fast, so it wasn’t all smooth sailing. I had fairly significant diarrhea starting toward the end of day 2. I’m not sure exactly why but in hindsight I’d guess that my body just wasn’t used to fasting. One of the most important things to understand about fasting is that it acts as a diuretic for your system, eliminating lots of water and electrolytes from your system. So it is very important to replenish both by drinking lots of water and taking extra salt. I know salt has been somewhat demonized it our culture, but it is much more likely that you aren’t getting enough salt than too much salt if you are fasting. My favorite method of adding salt is just putting a pinch of sea salt under my tongue several times a day. I also take an occasional Epsom salt bath to help restore magnesium. Sometimes I use a little lite salt for potassium as well. Despite being my first extended fast, the fast was a resounding success. I lost 10 pounds over the fast, and only briefly regained 3 pounds after ending the fast. My average morning blood glucose drop to 110 to 120 mg/dL on my non fasting days. That’s drop 40-50 mg/dL, a very significant improvement. My energy level was very high while I was fasting. Higher than normal. I’d heard your body produces extra energy while fasting as well as extra human growth hormone. And I felt fantastic. I was definitely going to add extending fasting as a regular part of my health routine. Dr. Nadia Pateguana, my nutritional consultant in the IDM long distance program, was a little surprised I had started fasting before even having the introduction webinar, although she had mentioned that it was not completely uncommon for long distance program patients. I feasted for the next 8 days, before my next 3-day fast. In June I did two 4-day fasts and an 8-day fast. By the end of June, I was down over 30 pounds and my average fasting blood glucose was between 90 and 110 mg/dL, which was just about where I wanted it to be. On June 20, 2017 I had my HbA1c checked and it came back as 5.5%. Just as a point of reference, anything less than 6% is considered normal, 6-7% is considered pre-diabetic and over 7% diabetic. I went from having a diabetic HbA1c while using 120 units of insulin daily to a normal HbA1c taking no insulin just by following the ketogenic diet and introducing insulin. Talking to my pharmacist wife and medical professionals, this is not normal. It is very rare for people to ever stop taking insulin once they start. Or I should say, it is very rare for people following the standard American diet to ever reverse their diabetes. Since adopting keto, I have interacted with dozens of people who have similar stories to mine. 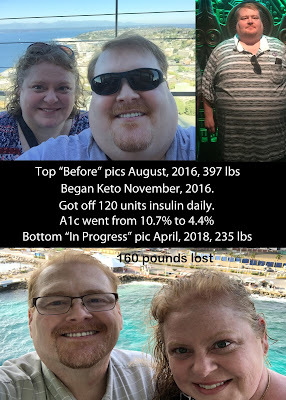 Brenda Zorn’s doctor actually removed her diabetic diagnosis after following keto for four years. 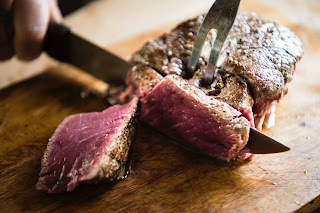 Keto seems to be just about the best thing ever for type 2 diabetics. In fact, there is growing evidence that it may be beneficial for type 1 diabetics as well. Since starting fasting, I’m doing an extended fast about 45% of the time. This would likely be too much for many people but I still have well over 100 pounds of excess fat to lose, so plenty of fat to burn for energy. I assume I will decrease the amount of extended fasting I do as I approach my optimal weight. of course be very careful if you have any type of eating disorder. In my next post I discuss my journey to a festival celebrating the ketogenic diet. You can also ready my previous post which discusses my appetite for information about the ketogenic diet.